Bronze & Satin Nickel Hooks. 15" to 52" with 3 to 10 " hooks . Select a 3.5 inch wide rail or a spectacular 4.5 inch X-wide solid hardwood rail. 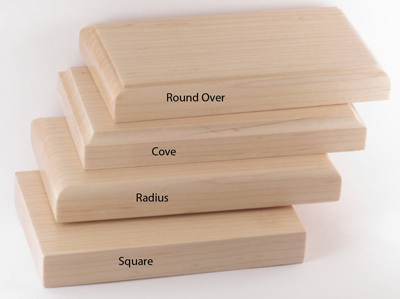 Created from hand selected top grade solid poplar or Maple, built to last. Choose from our standard 3.5 inch wide or our impressive 4.5" X-wide rails. Solid wood rails 100% Made in the USA. Would you like a custom size or layout? Just let us know what your needs are. 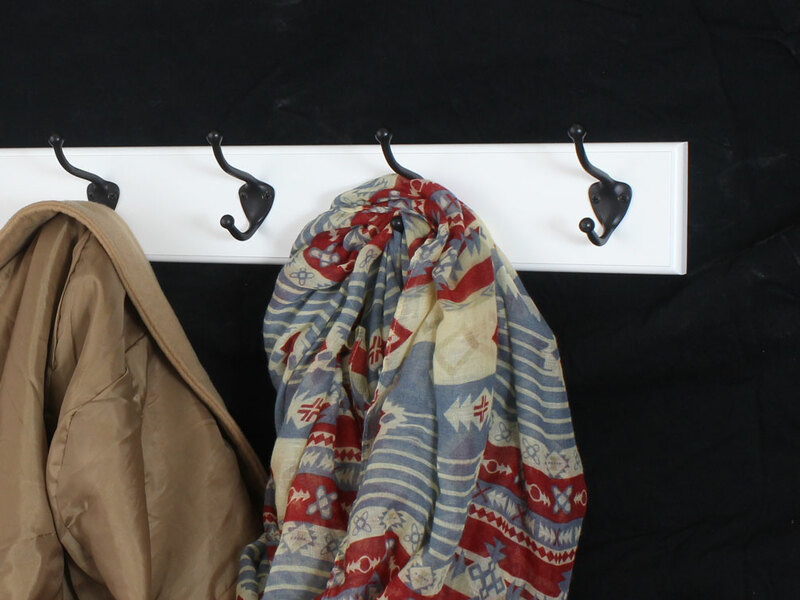 I love the hook rack - it has the exact look I wanted - hand crafted and not generic hooks - looks so much better than a pottery barn product! Excellent quality. Very easy to install!! I have not attached to door yet but they look great. Good quality and very satisfied. I would recommend to my friends. thanks for great service! I searched everywhere to find a row of coat hooks that would fit perfectly in my new laundry room. 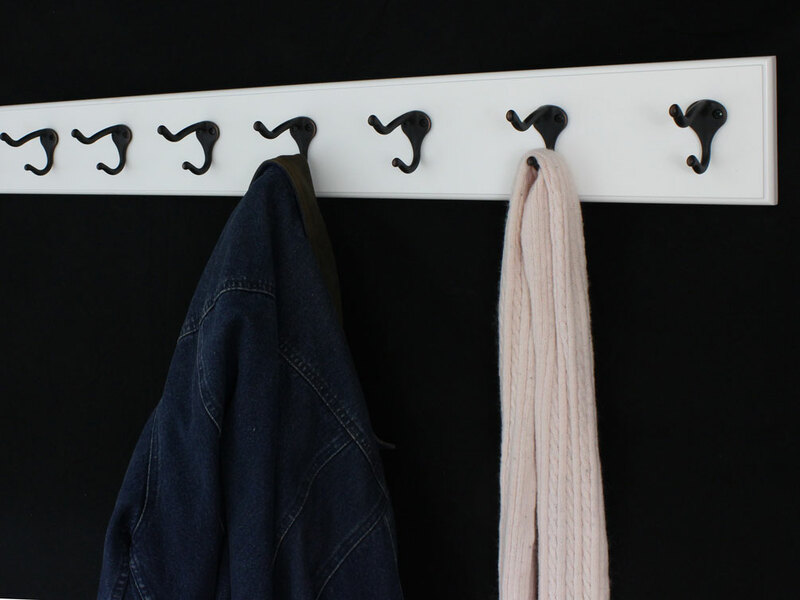 These hooks are perfect. I was able to choose the size and style. It is exactly what I had in mind and could not find anywhere else. Ordered a custom size. Arrived very quickly and was exactly what I was looking for. Well made and tastefully finished. Very happy!! Wow, not only shipped fast but I was so impressed by the quality and the simple beauty of my white coat rack with oil rubbed bronze hooks!! Such a current yet classic look right now and I love! The white is a soft rubbed white, not a factory-looking cheap box store finish. Now I want another one, going to inquire on custom sizes. What a great find! Perfect for my laundry room remodel! I love the high quality of my new coat rack! It is the perfect finishing touch for my remodeled laundry and mudroom. It looks great and is very functional. Very nice craftsmanship, the coat rack fit perfectly and looks great. Thank you for your time in making this nice product. Very Respectfully, Stephen C.
Ordered two coat rails in custom length. The hardware is austerely beautiful. The mounting screws are cleverly hidden behind the hooks. Loved the wide choice of rail edges. Ed, the owner, helped figure out what length and configuration of hooks would work. Price may seem steep for the simple pieces I wanted, but no one would have done it better for less. Imagine them in their setting: two plain rails -- each set just below a six-paned window -- on either side of a storm door -- in a newly built, cottage-style mudroom/breezeway -- that has white beadboard walls -- plain white window and door trim -- slate tile floor -- and peaked ceiling of tongue-in-groove planks painted the traditional robin's-egg blue of New England porch ceilings. Perfect harmony. 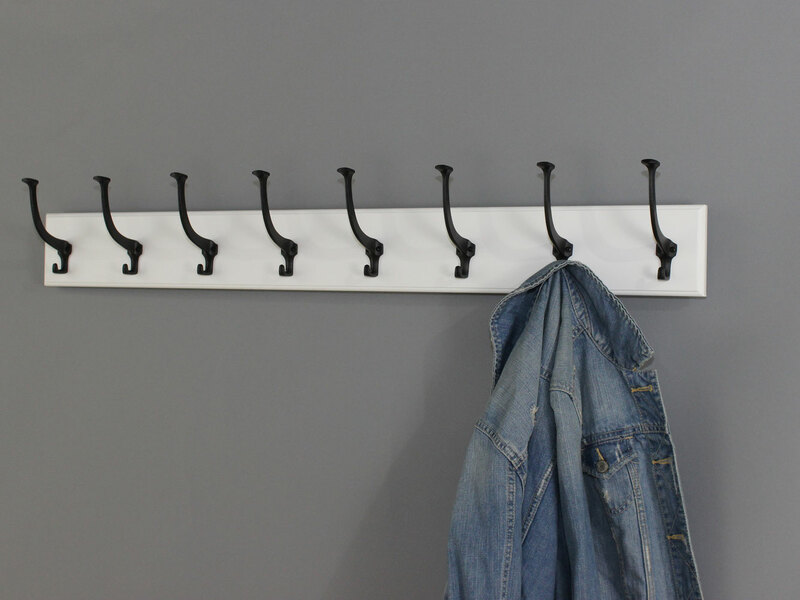 Loved the white coat rack with hooks. Looks great!!! Excellent quality! 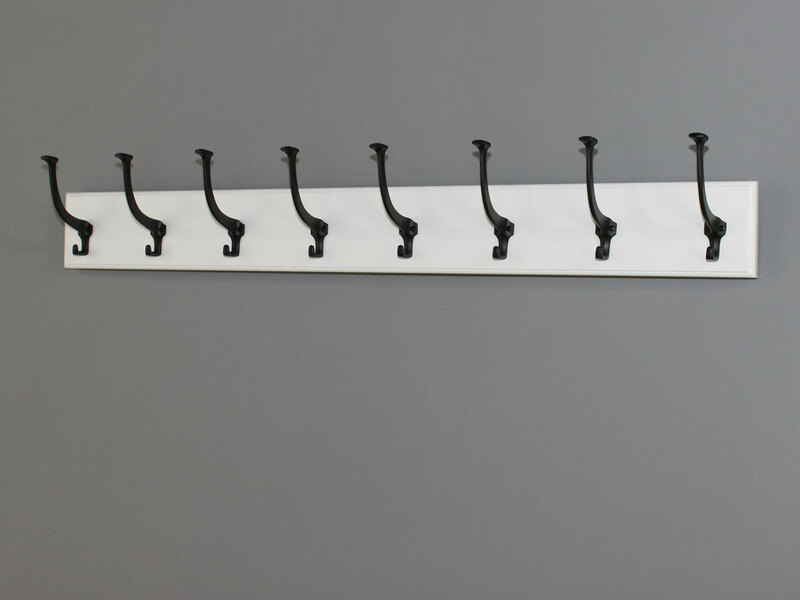 The high quality of this coat rack is amazing! The different options available when ordering are not something you see often. The coat rack arrived on time and was better looking than viewing online. I was quite surprised! It was also very easy to install! Consistent with the other reviewers, I am very pleased with my 5-peg hat and coat rack. The rack is very sturdy and solid and well crafted, and I appreciate how the owner clearly has high standards for his products. It was easy to mount with clear instructions and the hardware all included. The rack ships partly assembled so you don't have to assemble it all from scratch and I appreciated this. It looks fantastic on my wall. I'm recommending the product to my friends and will definitely buy from pegandrail again if I need anything else. I bought the white rail with bronze hooks and it looks great. I'm very happy with it. I was constantly looking for something like this in the stores but they were too small or they didn't have bronze hooks. The item was shipped to me right away. The only downside is that it's a little pricey for a coat rail. Q: how many lbs. 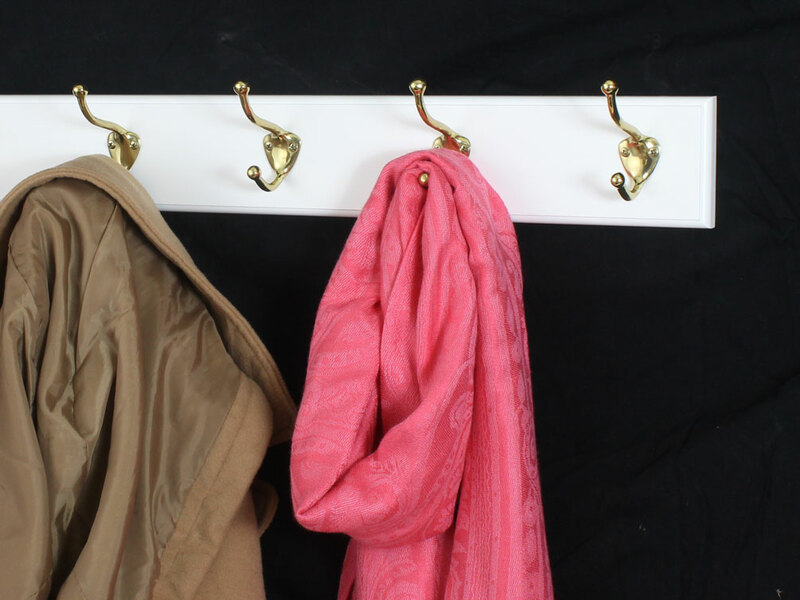 can an 8 hook coatrack hold? We have 6 boys and we're looking to put up hooks for their outer wear and backpacks. A: Should not be a problem the hooks are strong and the rail is solid Maple. I would not hesitate to put 20 LBS or more per hook. One limiting factor would be how you mount it to the wall. As long as it is mounted to the studs no problem if you use some type of anchor the anchor design may limit weight. 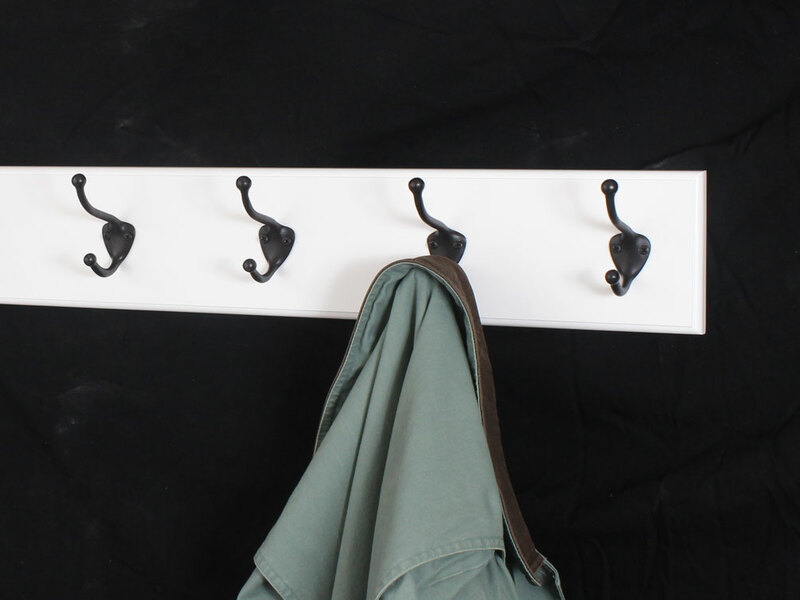 Yes we can make you a 72" white coat rack with our bronze hooks. Pricing will depend on a few factors, how wide would you like the rail? We have a standard 3.5 and a 4.5 inch wide rail or we could also do a custom width. How many hooks would you like? A six inch spacing would give you 12 hooks our standard hook spacing is 5.33 inches which would give you 13. Three dogs certainly are a handful! That’s especially true when they all want to go for a walk and you have to untangle three different leashes while your furry friends bounce around in excitement. There has to be a better way, and there is thanks to this hand crafted piece. 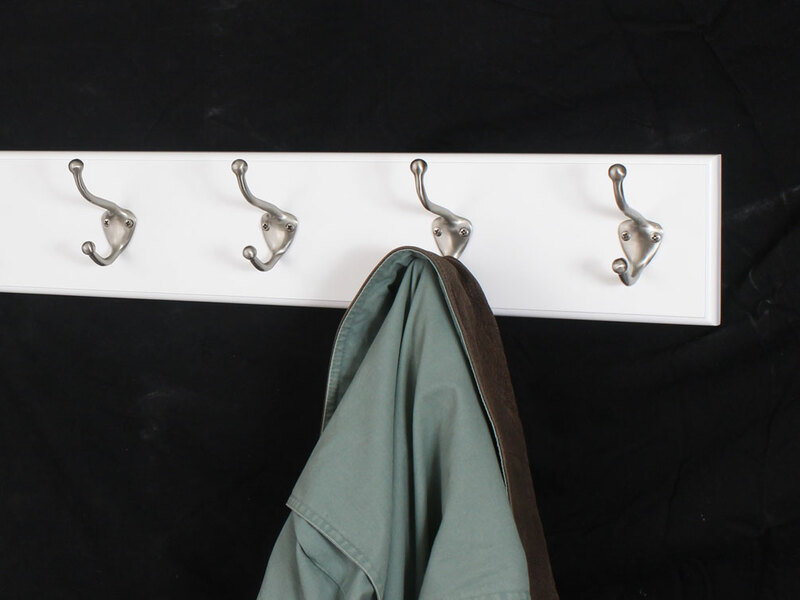 With this solid hardwood coat rack, you will easily have a place to hang each of the dog’s leashes whenever you get ready to take them for a walk.